Installed a Rak Attach on our rig. Pictures speak to quality and functionality. Rak Attach made this variant to fit an Aluminess bumper. Test fit on a van's bumper before shipping out. 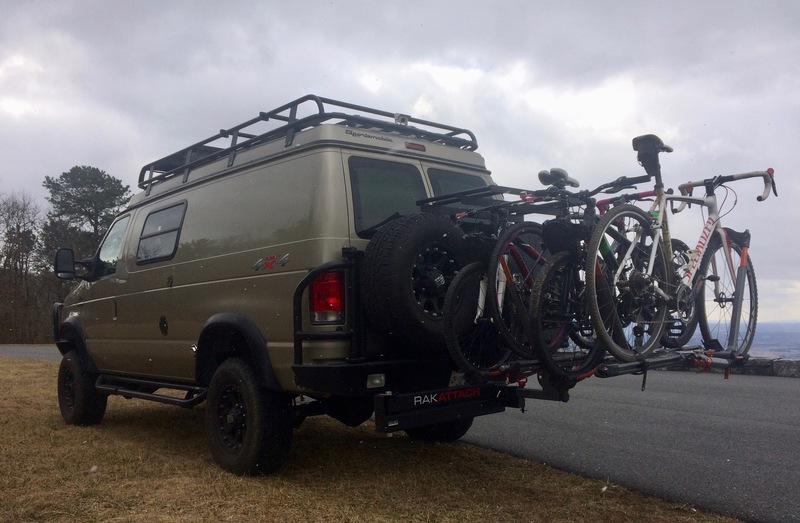 Provides easy access to the rear doors even when fully loaded with 4 bikes. Ended up using a Blue Ox Hitch Immobilizer II to eliminate sway. Amazing product and great customer service. Made in the U.S.A.
Nice! I like how far the arm swings out. Do you want to sell your swing out Aluminess bike frame? Bellpilot, I'm going to hold on to it. I originally had two bike trays up there but found loading and unloading the bikes to be cumbersome. Eventually going to put a tray up there to carry leveling blocks and recovery gear. Just need to find the time. Sounds like a good plan! Did you build this frame? Thanks! We only have two bikes and use a Tule swing out now but it seems to always be in the way. Like you said the loading on an Aluminess rack is also a pain. 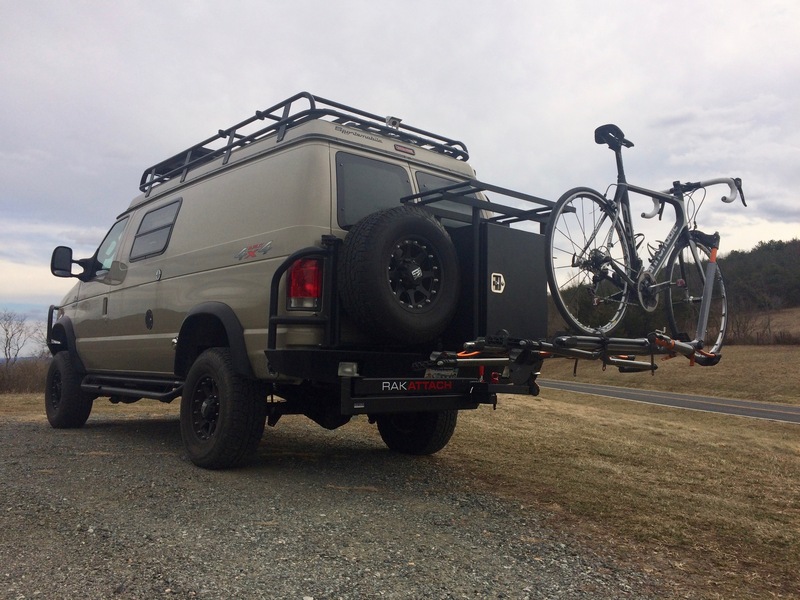 Currently a lot of interest getting generated in these RakAttach (and HitchSwing) setups. How do you feel about the overall *security* of that swing-out setup? Normally, bikes can be locked semi-securely to the bike rack itself. 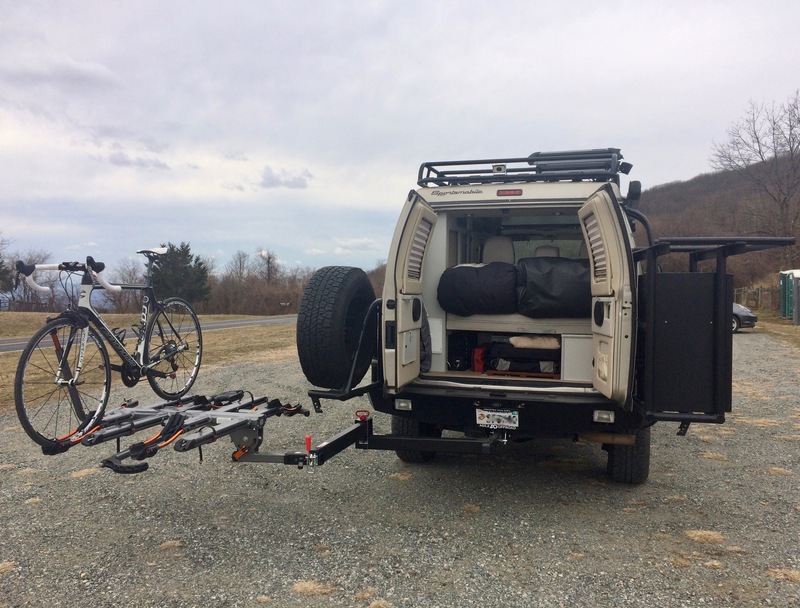 And the bike rack can be "locked" into the hitch receiver on the back of the van (with a locking hitch-pin.) So it's *all* a "locked down/together" system. But (briefly thinking like a thief, which you've gotta...) --- I could see how with that RakAttach.....an enterprising sticky-fingers could simply unbolt the pin which that RakAttach swings on, and then happily (if a bit awkwardly) walk off with the entire RakAttach swing arm (and bike rack/attached bikes). Then throw it in the back of their pickup truck (or truly sketchy van)...and make lost. A whole lot of cherished/needed/hard-worked-for gear and bikes, potentially gone.....all made possible by someone simply unbolting the one pivot-bolt. From what you (or anyone else) can see --- is there any kind of built-in security to the RakAttach's swing-pivot bolt? (Or on those similar HitchSwings, for anyone else following this thread familiar with those?) Anything that would slow someone down from simply unbolting the swing-arm and walking away with whatever you have attached to it? If not, I'd be interested in putting some sort of locking pin through that pivot as well. .....I must say that is one very sweet setup!!!! Valid point on the pivot bolt. There's nothing to prevent someone from removing it. That said, the enterprising thief would still have to deal with locked bikes and the lockable hitch pin used to mount the bike carrier. I guess the only solution would be to install a lockable bolt. You could throw a tack weld on the nut, but of course, if a thief wanted it, he'd find a way to get it.... lock or not. No retail prices on their website. Can you give me a ball park?